Episodes 512 & 513 of The Router Workshop in Series 500 featured the construction of stairs. This is the start of a series of router tips which include helpful information when building stairs. The complete episode of Bob and Rick constructing stairs is featured on the Series 5 DVD (2 disc set) which will be released next week! First, determine the height then divide it equally so that all rises will be the same. For instance if the height for your stairs is 84", 12 divides equally into this 7 times, you would have 11 steps and 12 risers 7" high. The tread size is something you decide but be sure to calculate head space on the way down. It was always the norm to make sure all were equal, this has now changed and you will see an odd height on the bottom stair (either higher or lower) in many showhomes. Once you have the numbers for the rise and treads, mark it out on a piece of cardboard, cut this out to give you a sample stringer and try it out for size where you are putting the stairs. The picture below shows two different designs of gauges. The longer set on the left are specially made for stairs and are sold as such. The smaller set on the right may be used for marking rafters as well. If you don't have gauges you can make your own! 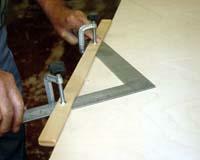 Use 3/4" stock and cut a strip 1 1/2" wide x 18" long. Cut a slot on each end thick enough to accept the square. Set the gauges on the square at your required measurement, this will provide for accurate marking on each step without guessing. 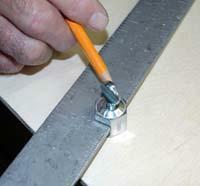 Lay the square on to your stock, keep the gauges tight against the edges as shown and trace your stair pattern. To use the shop made gauge simply slide the stick on to the square at the correct measurement for your stairs. We used two small "c" clamps to hold the stick in place while you mark your stock.